Noted social worker and Anna Hazare who was in Itanagar criticized the Government of Arunachal Pradesh for ignoring the issue of former Chief Minister Kalikho Pul’s death. Addressing a rally against corruption at Indira Gandhi Park in Itanagar on Saturday, the octogenarian social activist termed Pul’s death a ‘murder’ and said that the government should initiate proper investigation to unearth the truth behind his death. Hazare also said he would take up the issue of Pul’s death in all his future rallies and movements till justice was delivered. He said the issue would top the agenda of the mass movement against corruption, scheduled to be held on March 23 next year at Ram Leela Maidan in Delhi. Hazare also came down heavily on Prime Minister Narendra Modi on the ‘hollow assurances’ he made to the nation. Advocating implementation of the Lokpal Bill, the veteran activist said when Modi was the Chief Minister of Gujarat, the then Governor had pressed for passing the Lokpal Bill, but, “It was Modi who fought against its implementation in the High Court and the Supreme Court,” he said. “We expected much from Modi, but he has failed to deliver on his promises,” said Hazare, and questioned Modi on the promise he had made to the people of the country that each citizen would have Rs 15 lakhs in their account. 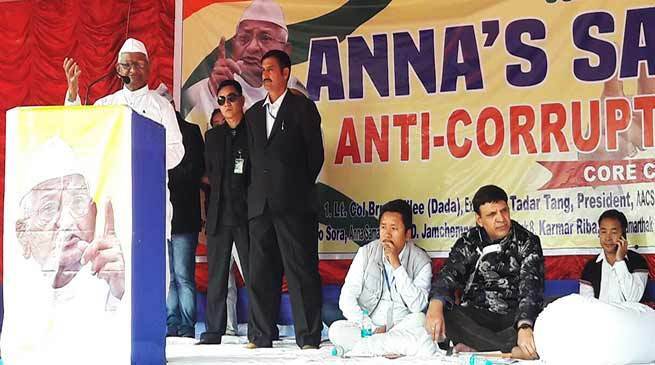 Hazare called upon the youth of the state to rise to the occasion and fight against all forms of corruption, as well as seek justice for former Chief Minister Kalikho Pul. Organizing Committee Chairman Serpi Flago briefed the gathering on the movement scheduled for March next year, and invited the youths of the state to join them.